The story below is cross-posted from Venue, where you can also read about performing horses and saloon cats in the Denver Public Library archives and pop-up opera at Whole Foods in Miami. Venue — a pop-up interview studio and multimedia rig traveling around North America through September 30, 2013 — is a project of the Nevada Museum of Art’s Center for Art + Environment, Future Plural, and Studio-X NYC, with funding provided by the Western States Arts Federation (WESTAF), Nevada Arts Council, and the National Endowment for the Arts. Kazakhstan Elite, Jessica Rath, high-­fire glazed porcelain, 2012; photograph courtesy Jessica Rath. Every apple for sale at your local supermarket is a clone. 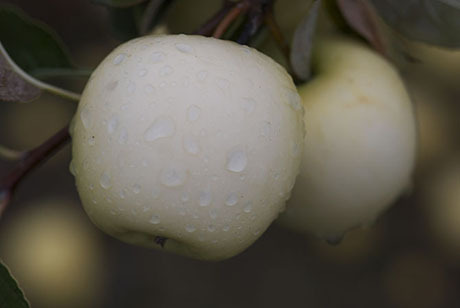 Every single Golden Delicious, for example, contains the exact same genetic material; though the original Golden Delicious tree (discovered in 1905, on a hillside in Clay County, West Virginia) is now gone, its DNA has become all but immortal, grafted onto an orchard of clones growing on five continents and producing more than two hundred billion pounds of fruit each year in the United States alone. Embedded within this army of clones, however, is the potential for endless apple diversity. Each seed in an apple is genetically unique: like human siblings, seed sisters from the same fruit remix their source DNA into something that has never been seen before — and is likely, at least in the case of the apple, to be bitter, tough, and altogether unpalatable. 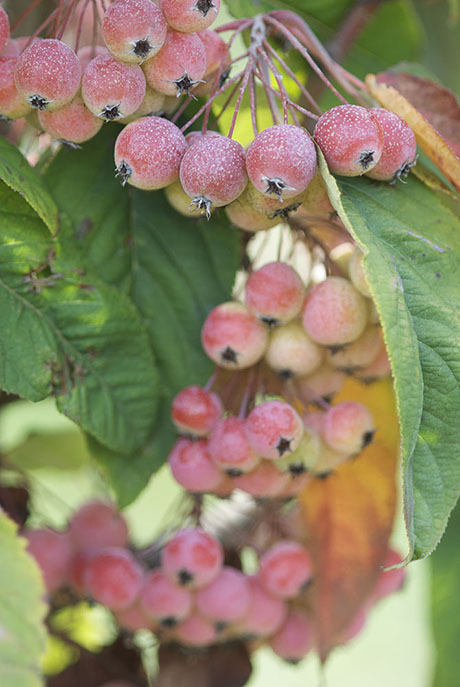 The sheer variety of wild apples is astonishing: in its original home, near Almaty in Kazakhstan, the apple can be the size of a cherry or a grapefruit; it can be mushy or so hard it will chip teeth; it can be purple- or pink-fleshed with green, orange, or white skin; and it can be sickly sweet, battery-acid sour, or taste like a banana. Tasting apples at the Plant Genetic Resources Unit; photograph by Jessica Rath from her 2009 visit. 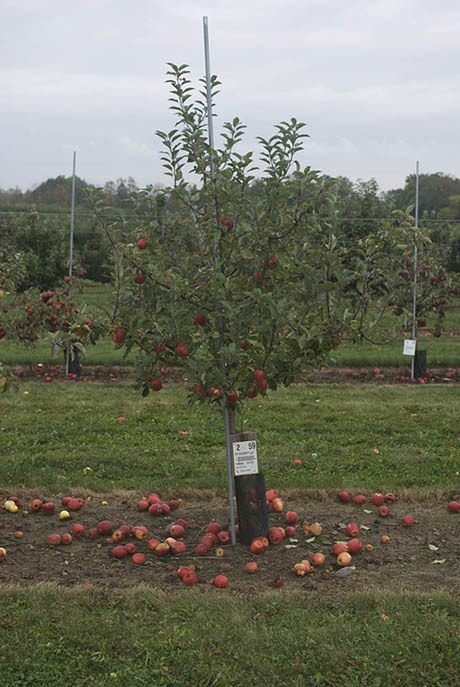 In Geneva, New York, these two extremes — the domesticated apple’s endless monoculture and its wild diversity — can be found side-by-side. As part of the national germplasm system, America’s apple archivist, Philip Forsline, has assembled and tended a vast Noah’s Ark of more than 2,500 apple varieties: two clones of each, in order to preserve the fruit’s genetic biodiversity. 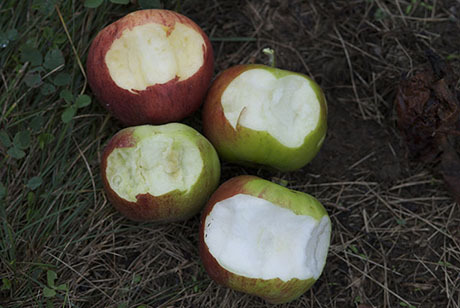 Meanwhile, on the same Cornell/USDA Agricultural Experiment Station, Susan Brown, one of the country’s three commercial apple breeders, develops new clones by cultivating wildly different seed sisters. 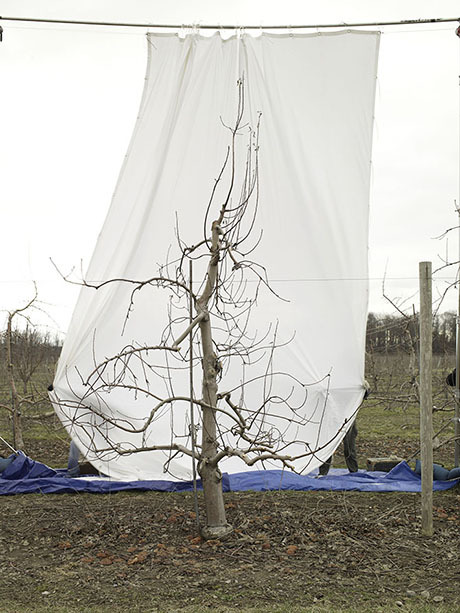 In 2009 and 2011, artist Jessica Rath visited both the Apple Collection at the USDA’s Plant Genetic Resources Unit and the Cornell apple-breeding program, creating a body of new work, currently on display at the Pasadena Museum of California Art under the title take me to the apple breeder. 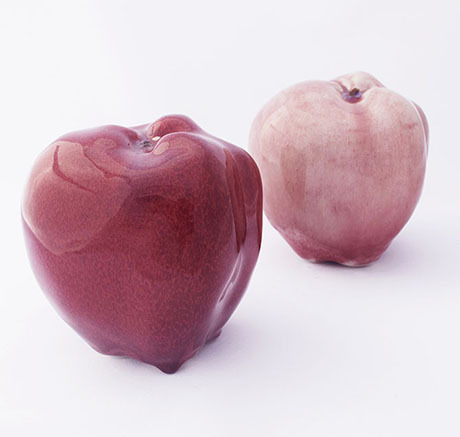 Rath’s original goal was to create slip cast porcelain sculptures that embodied the incredible — and now endangered — range of the apple’s aesthetic potential; revealing the charms and qualities it has developed through co-evolution with humans as a reflection of our own desires and will. 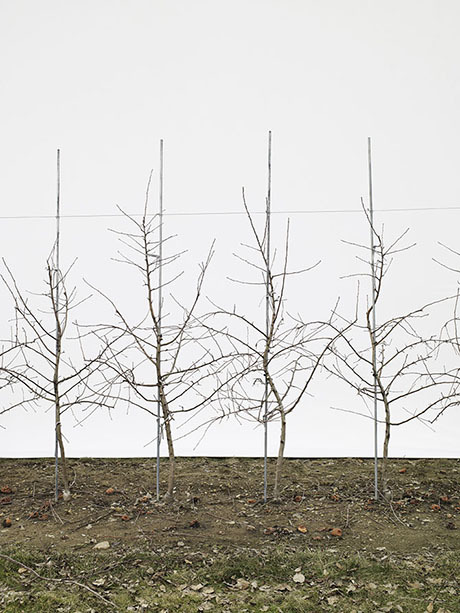 During her visit, however, Rath also became fascinated by the conjoined twin of Forsline’s apple archive: Brown’s speculative sisters and successful, selected clones, which she photographed as bare-branched trees against a white backdrop. 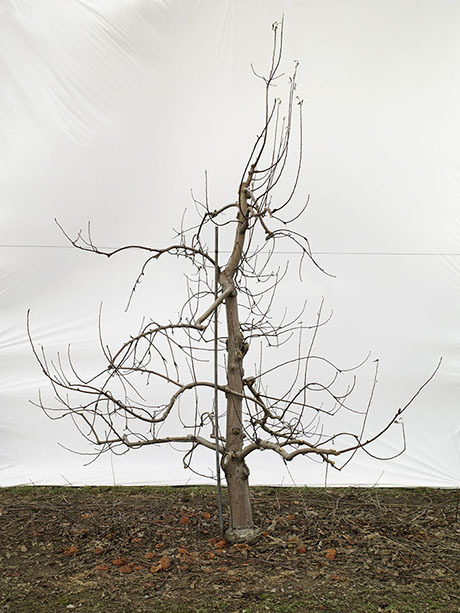 Intrigued by the idea of artwork that reflects on the complicated threads of selection and preservation that bind humans and apples together, Venue toured the exhibition with Rath. The edited transcript of our conversation, which ranges from the trickiness of Vegas Red glaze to the future of apple breeding, appears below. Nicola Twilley: How did you come to visit the Apple Collection at the USDA’s Plant Genetic Resources Unit in upstate New York? Jessica Rath: I read about it in Michael Pollan’s The Botany of Desire. The first chapter is about apples, and he visits the orchard in Geneva. I read that section and I knew I needed to make work about it. I don’t do that very often but that passage, where he writes about the variety of the apples and the way they look and taste… I wanted to make something as intriguing as that — I wanted to get you to feel that crazy diversity. I sat on that for years. I wanted to go there, but I had no idea how I was going to make work about it. Sunset cluster, Jessica Rath, high-­fire glazed porcelain and bronze, 2012; photograph courtesy Jessica Rath. I just bookmarked it, and then my apricot tree died. I made a peel — an inverted mould, I guess — of this dying tree, and I made a slip cast of its one, last fruit. I’ve changed mediums constantly in my practice — I usually do site-specific installations or I do performance work — but I talked to some sculptor friends to find out how to create a sort of glowing, golden aura for this last apricot, and they all said slip cast porcelain. So I made it, and I looked at it and, and I thought, that’s not it. That’s not good enough. But it did glow. And that’s what made me think I was ready to do something with the apples. I thought, if I can make them glow, then I can make this work. So that’s when I raised some money on Kickstarter to be able to get there. That was the other piece of the puzzle that fell into place. My daughter was a baby and I hadn’t read anything in months, but I was on a flight and I picked up The New York Times, and there was an article about Kickstarter. I went home, I raised money on Kickstarter, and I got it about a month before the end of apple season; so I raced over to the Plant Genetic Resources Unit for a forty-eight hour visit. Scouting for apples at the Plant Genetic Resources Unit; photograph by Jessica Rath from her 2009 visit. I learned a lot while just scouting on the first day, from a man named William Srmack who manages the orchards and works directly with Philip Forsline, who’s the curator of the collection. On the second day, I just collected apples. I brought home several hundred apples. Part of the Kickstarter money bought an extra refrigerator for the studio and I loaded it and kept it pretty cold. 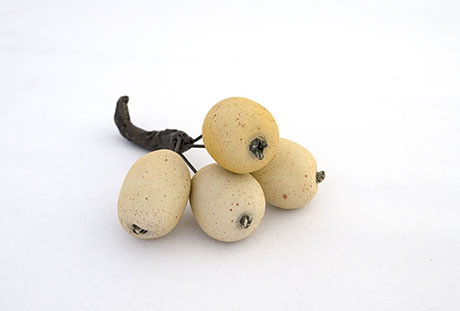 I took a lot of photos of the fruit on the tree, and in a light box, too. PI 483254.22 (unnamed—sunset cluster); photographed on the tree by Jessica Rath during her 2009 visit. Twilley: Let’s look at the sculptures. 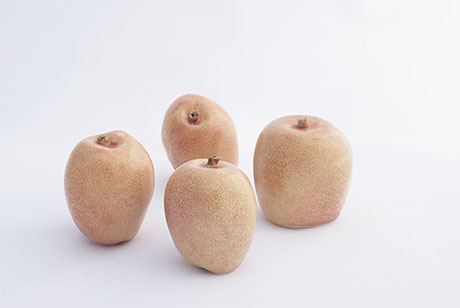 If I understand correctly, although each pair or cluster represents a different breed, they’re not casts of specific, particular apples, but rather abstracted, ideal forms — or ur-apples — that embody the breed’s characteristic shape and colour. Rath: Exactly. With slip cast porcelain, you lose thirty percent of the volume when you fire. 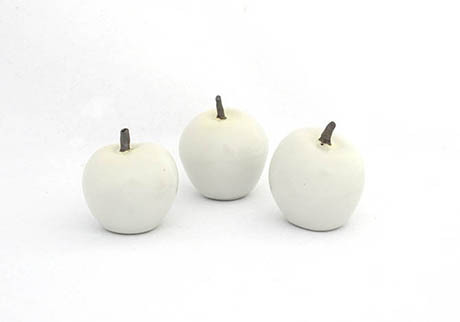 So, even if you wanted to do a cast of the original apple, you couldn’t get the same scale because it would be shrunk by thirty percent, which not only makes it too small, it also miniaturizes the features. It makes it kind of a caricature. It isn’t just small, it’s cartoonish. So it doesn’t work. I already knew I had to make an object thirty percent larger in order to get the scale right. But the other thing is that I didn’t want to make something descriptive. I wanted to make something that communicated something about the wild diversity of these apples and the ways that they embody different facets of our desires through the science fiction of breeding — the thing Michael Pollan is writing about. When you describe things accurately in a botanical drawing sort of way, it dies. When artwork is too illustrative, it can only describe and it can’t go any further than that. You recognize it and then you stop being interested. You’re amazed at the replication, you’re amazed at the representation, but then you actually can’t think about it as anything other than its finite definition. For my sculptures, the shapes are very similar to the original. They’re just pushed a little, so that the things about them — the sculptural elements about them, their particular volume or tilt, or how fat and breast-like they are — are composed three-dimensionally in such a way that you notice them a bit more, and they pop a little. They’re not on a tree. They’re not something that’s dangling that you want to pick because you want to eat it; so, instead, I have to make them attractive through a very different model — an art historical model. I’ve got to present them like they’re a still-life, and compose them in that framework, so that you can be intrigued by them again the way you would be if you saw them as a fruit on a tree. Geoff Manaugh: In the exhibition brochure, it says it took two years of experimentation to arrive at these glazes. Can you talk a bit more about that chemical process? Rath: In ceramics, there are low-fire glazes, which are very descriptive. They stay the same colour. Then the high-fire glazes have more of a glow to them. They also just have a lot of materials in them, and are a lot more unpredictable. You’ve probably seen it at pottery stalls at the fair: when you look at all the mugs or plates or whatever that have all been dunked in one kind of cerulean blue, they will all have turned out slightly different. Some of them will be light blue or whiter or purplish, depending on where they were in the kiln and how thick the glaze was on it and how it dripped. I originally did that apricot, that last fruit, in a low-fire glaze. But for the apples, I steered away from being that descriptive with the glazes because they died for me, except for ones in which I would layer quite a few low-fire glazes. There’s this fuzzy speckling you can get in low-fire, which I wanted. Normally, you would make little rectangular tiles of clay and you’d fire it and you’d have fifty little things to test the glaze on, till you got roughly what you want. But these apples are round and irregular rather than flat, and the glaze moves on them in very particular ways depending on the size and the angles of their curves, so I couldn’t test on strips. I had to test on the object. This one [shown above], the Deacon Jones, probably took one hundred tests. This was the hardest one, even though it’s the straightest glaze. All of the others are tweaked a little, but the glaze on this is pretty straight. It’s called Vegas Red and it does get this red but usually only in parts or pieces, say, at the bottom of the bowl. It doesn’t stay a solid red. And it also drips. So to get it to actually sit there and get this red all over is one out of one hundred, if you’re lucky. It’s also down to a very, very close relationship with the ceramic technician that took about two years to build, so that after two years of watching me fail over and over again, he put it in a sweet spot in the kiln. He’s Japanese, and he’s pretty old-school, and I think he thought I had finally worked hard enough that I deserved a sweet spot. There’s only one or two of them in the kiln. All of a sudden I got three perfectly red apples in a month. I knew I was improving over time, but it was that relationship, too. 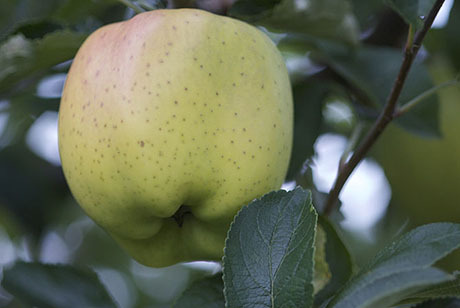 This is an unnamed apple [shown above], which is based on trees in the orchard that were grafted from wild apples in Kazakhstan, from the original home of the apple. It’s low-fire over high-fire. 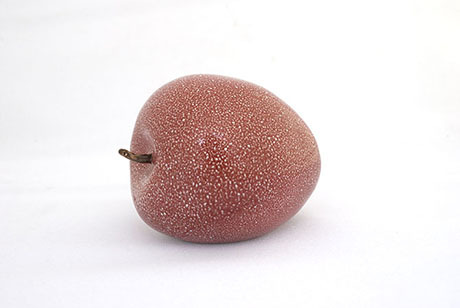 I was interested in this sort of speckling blush that they had, but then the blush took over. My approach was to get to a point with the experimentation where I found something that grabbed me and then let it go with that and work with that. Twilley: That sounds a little like the apple breeding process. Rath: Yes—I found a quality I liked and then I bred and bred to refine it, essentially. This is a Dulcina, which is another one with a blush that I arrived at while I was trying to get the rest of it into a more green or yellowish stage. I loved the metaphor of the night sky that’s held in it, so I just went for that. Dulcina, Jessica Rath, high-fire glazed porcelain, 2012. There’s supposed to be an edition of two of each of these apples, and I’m unable to replicate this one. It’s the last one. I’m still working on it. After you leave, I’ll go up to the kiln again. 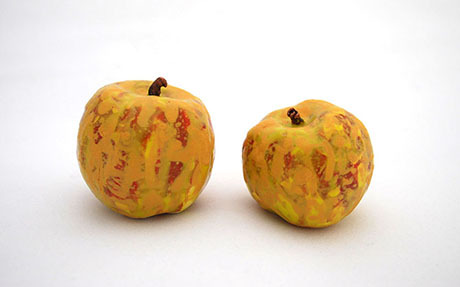 The idea of producing an edition of two is an odd one in sculpture, but it made sense for the apples: they’re always planted in pairs in the orchard, as a Noah’s Ark idea — in case something happens to one. 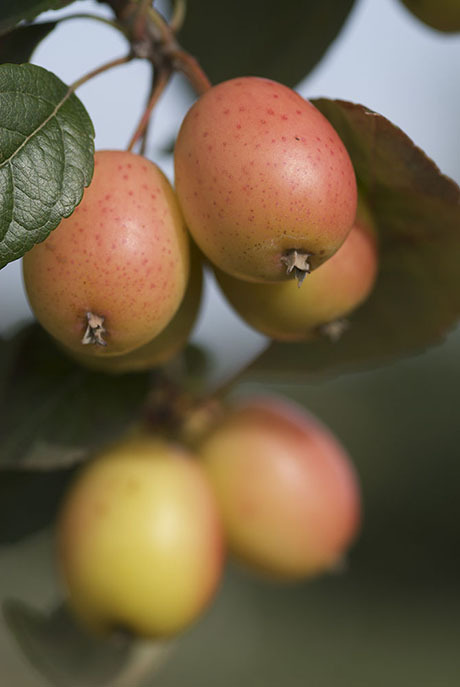 These final ones [shown above] are very, very pale yellow on the tree and when the sun hits them they turn white. You know that they’re yellow, but when you’re in this orchard, things look different. I’ve described it to people as being like when you go fishing, and when you catch a fish, it has a certain glimmer to the skin while it’s alive. As soon as you kill it, as soon as it’s dead, the whole sheen shifts into a kind of grey. The depth of the colour is not the same. It’s immediate. I swear that these apples have the same thing. There’s something about them when they’re on the tree — they have this luminosity. As soon as you pick them, the depth of the colour isn’t there, and the whiteness is just a pale yellow. You can’t capture it in a photograph, either. That’s why I chose ceramics. I’ve no business doing any ceramics. I’ve never done it before. I’m a sculptor, but sculptors and ceramicists are usually in separate departments. But when I saw what the glazes could do, I thought that I could catch that life again. Porcelain vitrifies — it turns to glass with the glaze — which means that the body of the sculpture and the colour that’s applied, this glaze, become one body. That’s a technical thing, but it’s also real and aesthetic. In sculpture, that doesn’t happen. You can use car body paint to make something glow and shift in the light, but it’s always applied, and in ceramics the colour and the body become one. I had a whole series of fifteen years of work where I never used colour because I always thought, what’s the point? It’s not part of the body of the work; it’s just applied. 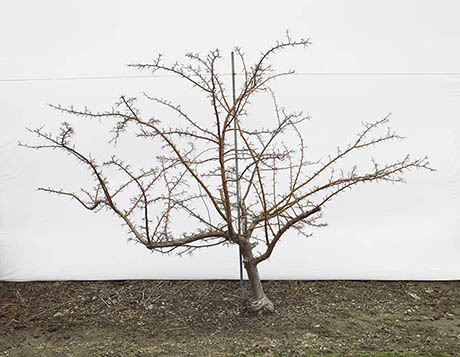 Twilley: Did you take the tree photographs in the show at the same time, or is that a separate project? Rath: While I was at the Plant Genetics Resource Unit, I got a call from this woman, Susan Brown. I don’t even know how she got hold of me, but thank god she did. 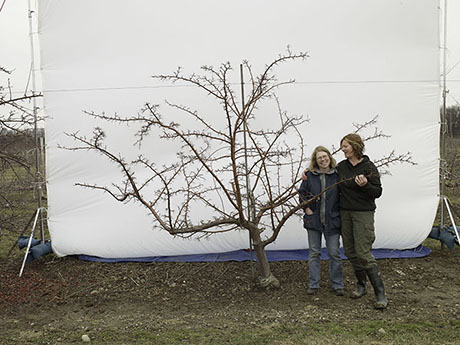 She said, “You need to come over here, because I’ve got these trees and you need to see them.” It turns out she’s one of only three commercial apple breeders in the United States, and her job is to cross apple varieties to improve them and create the next Jonagold. Dr. Susan K. Brown and Jessica Rath during the tree photo shoot, March 2011; photography courtesy Jessica Rath. I don’t know why I said yes. I was just very lucky. She picked me up in her truck and she showed me a row of cloned trees. It was October, so all of the leaves were still on the trees, and she hadn’t pruned them, because she wants to see what the architecture will do if it’s not touched. It was just this big row of green, and I couldn’t really see anything. Sisters small and different, Jessica Rath, archival pigment print on exhibition fiber, 2012. So then she took me to another row of trees that were just saplings. They had some leaves, but not many, because they were so young. Every single one of them had a different architecture — some of them were weeping, some were standing upright, some of them had branches like corkscrew or at perfect right angles. It was like a carnival. They were just different bodies, different leaves, and different sheens to the leaf. She said, “This is what happens when you cross.” Then I got it. She took me back to her office and showed me a big binder — she had been photographing her trees for years. She understood her trees as artwork, and she wanted somebody else to have a conversation with about that. 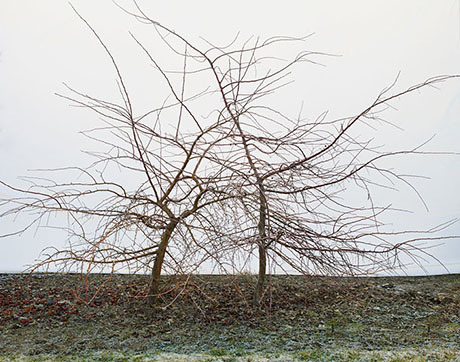 Sisters normal, Jessica Rath, archival pigment print on exhibition fiber, 2012. 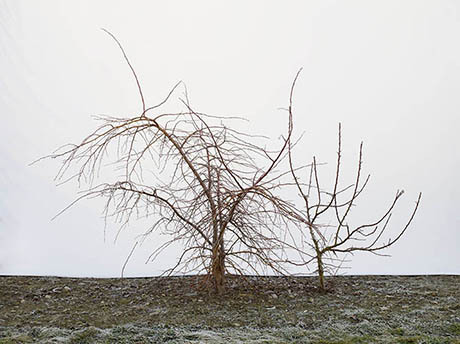 Sisters weeping, Jessica Rath, archival pigment print on exhibition fiber, 2012. She had tried to stretch these sheets behind trees in the winter, and I thought — that’s it! I need to do that, but I need to do it really, really well. So I applied for a grant to go back and photograph Susan’s trees in winter. I came back about a year and a half later. Susan and I spent a day scouting, then we shot for three days. I was trying to not only show the architecture and the diversity, but also what I wanted in terms of understanding her work, and the difference between the sisters and the clones. The sisters had this extreme variety, but when I went back, I fell in love with the clones. They were all covered in leaves before; I couldn’t really see them. But when I went back in winter, they seemed to not embody the diversity but rather, instead, embody this kind of limiting figure, this figure that had been worked on, that had been “improved” by humans, and that was beautiful but also really haunting. 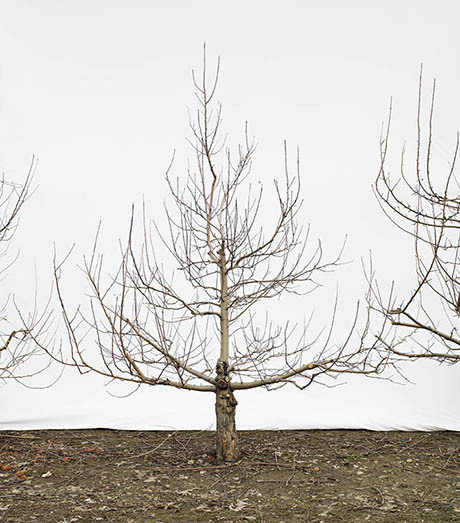 Clone with central leader, Jessica Rath, archival pigment print on exhibition fiber, 2012. Some of them are bred for their architecture, but lots of them are bred for other qualities — resistance to browning or disease, high yield, or taste — and are kept alive despite their architecture. Susan told me that they’re on the cusp of moving to quite a different way of breeding, using genetic markers, so, in the future, she probably won’t have rows and rows of such extreme variety. She’ll have more control. 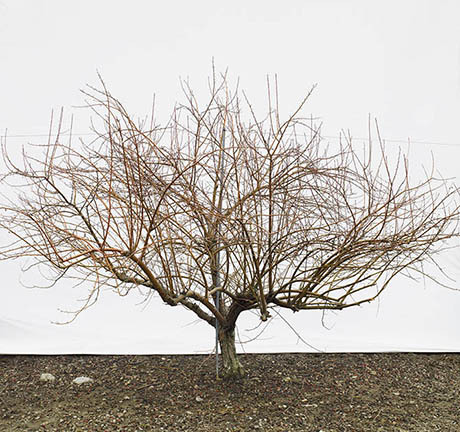 Clone spreading with scab resistance, Jessica Rath, archival pigment print on exhibition fiber, 2012. That idea of artificial selection versus natural selection, and the way that certain varieties become weaker, but yet more common, because they’ve entangled humans into maintaining them — that was something I was thinking about before I went to graduate school. I was working with flora in general, but I couldn’t figure out a way to get plants to talk, and so I gave up and moved on. Then, when I read The Botany of Desire, after fifteen years of staying away from the topic, it was as if Pollan had given me a voice for them — an imaginary voice in which they’re drawing us in through aesthetics and through taste in order to get us to reproduce them. Finally, I felt as though I could have a discussion with plants — that they had agency. Sisters smiling, Jessica Rath, archival pigment print on exhibition fiber, 2012. 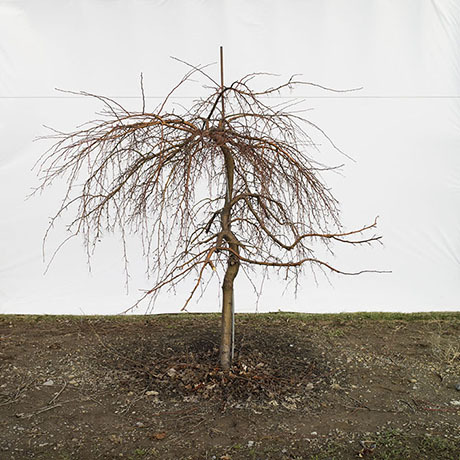 Clone with perseverance, Jessica Rath, archival pigment print on exhibition fiber, 2012. Manaugh: It’s interesting that the sisters are all shown in group portraits, whereas the clones are shot on their own, as individuals. Was that a conscious decision, and, if so, what was the intention behind it? Rath: It was interesting — I tried to shoot the clones as a group, but they just became a landscape. It just seemed that the way to show the clones was as an adult, as something that you would pull material from that had lived a life already, that was full of its own, carefully constructed shape already, and that had certain defined characteristics. I wanted it to capture the potential of using it for these breeding experiments. Meanwhile, the sisters are all about the variety. 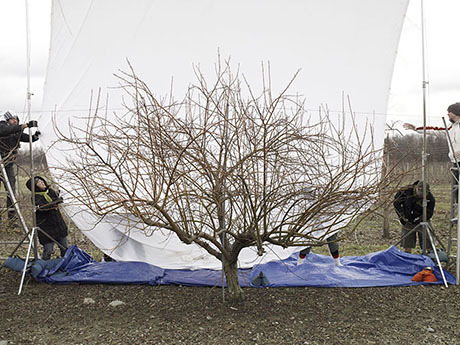 From left to right, Cole Slutsky, Mary Wingfield, Timothy Zwicky, and Dustin McKibben set up the 20 x 30 ft backdrop for the photograph Water Sprout; photograph courtesy Jessica Rath. Backdrop set up for Clone with central leader; photograph courtesy Jessica Rath. The set up was tortuous. I was using a twenty-by-thirty-foot muslin backdrop. There were five people holding it down, the wind was gusting — it could have killed all of us. There was a photographer, the photographer’s assistant, and me all shooting. We had computer equipment tethered to everything and the rows of trees are not very far apart, so we were really squeezed in to get enough distance. And it was early March, so it was unbelievably cold. 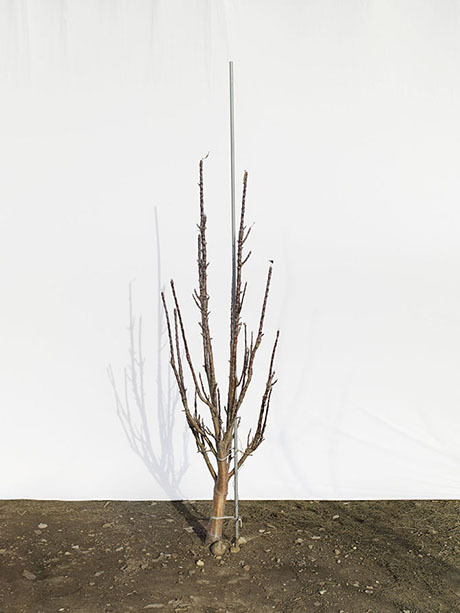 Clone water sprout, Jessica Rath, archival pigment print on exhibition fiber, 2012. I love this one [shown above], particularly because the horizon almost appears like it is an actual horizon, not just one created by the backdrop. For a second, you could think is there a cliff on the other side of the tree. And yet, behind the backdrop, the landscape is present in a sort of ghostlike way. For me, that’s part of the idea — that the landscape is constructed only as much as you need it to be in order to make the thing live. 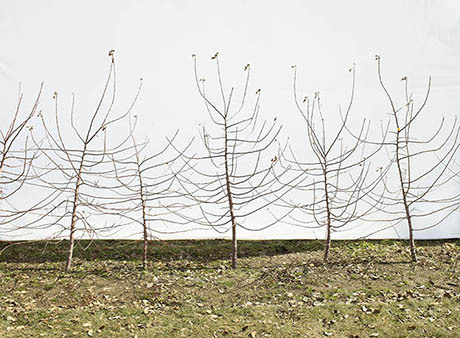 Clone weeping with resistance, Jessica Rath, archival pigment print on exhibition fiber, 2012. I also love the fact that there are allusions to the wind that’s there through the folds and ripples. I spent a lot of time working on these images in Photoshop, after the fact, cropping out and removing things — stray branches from other trees, and so on — that distracted from the composition. But I deliberately kept some of the ripples, because I liked the evidence of the physical tension in the landscape. It’s also part of pointing to the artifice. The backdrop doesn’t disappear, and so you remain aware that the whole thing is a construction. 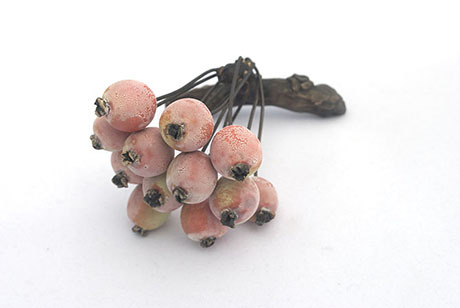 Clone with early pubescence, Jessica Rath, archival pigment print on exhibition fiber, 2012. The title of this one, Clone with early pubescence, [shown above] alludes to the fact that it’s budding too early, so it’s about to get cut down. It’s already dead to Susan, because it has no use. As we walked around, she was telling me about each of the trees — what will happen to them, or what is promising about them, or what she has used them for — and those stories definitely crept into the way I chose to frame and title the shots. Twilley: Finally, I’m curious about your next project. I’ve heard a rumor that you’re working on something to do with bees — is that true? Rath: Yes — well, tomatoes or bees. I loved Barry Estabrook’s Tomatoland. The idea of shipping tomatoes from Florida to New York in 1880, in a wagon? It’s crazy! [laughs] I’m doing a series of watercolors of tomatoes right now, which are very different than this. They combine scientific text with quotes from literature about redness, and blushes, and scarlet letters — all about how colours have been used to place judgment on things, and the gendered language that goes with that. There are a lot of “wenches” and “whores” in that series as well. Tasteless whores, too, because some of them are grocery-bought tomatoes. I’m playing with language like that with this series, which is a very different kind of playing than in this apple project — much less subtle. The bee idea involves visiting Dr. Nieh’s laboratory in San Diego. He’s a bee expert and he has figured out all these incredible ways that bees are communicating, to which he’s given wonderful names like superorganism inhibitory signaling and olfactory eavesdropping. I’m interested in doing an installation of a hive. It would be to human scale, and it would play with the biofeedback of the people in the hive, and how they interact, as well as the atmospheric conditions. The idea is to create a composition based on all those inputs that shifts in real-time, all based on the scientific research of Dr. Nieh into how bees communicate. I’m looking for a composer to work with on that right now. 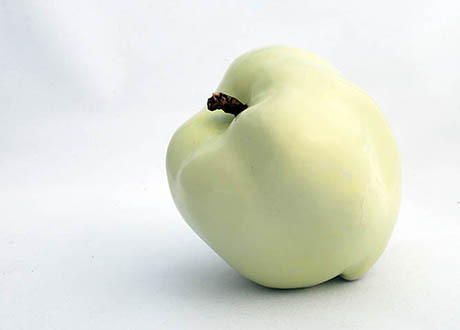 Jessica Rath’s apple sculptures and photographs are on display at the Pasadena Museum of California Art through February 24, 2013. Many thanks to Willy Blackmore for the suggestion! This entry was posted in Interviews, Venue. Bookmark the permalink. Trackbacks are closed, but you can post a comment.